We are announcing the discontinuation of our SalesforceIQ CRM Chrome Extension. 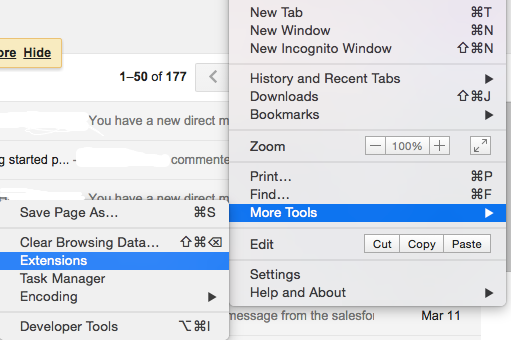 The SalesforceIQ CRM Chrome Extension was made to work with the legacy Gmail interface. Unfortunately, due to circumstances beyond our control, Google has changed this interface, and as of October 16, 2018, is planning on removing the option to switch back to the classic interface. More details on this change from Google are available here. As a result, SalesforceIQ CRM customers will no longer be able to use the SalesforceIQ CRM Chrome Extension. Customers typically use this extension with the Gmail product to make updates to SalesforceIQ CRM without leaving their desktop Gmail inbox. What will replace this product? At this time, we do not have plans to replace the SalesforceIQ CRM Chrome Extension. Customers are still able to access the SalesforceIQ CRM functionality through the standard desktop application or through our Android and iOS mobile applications. We encourage you to work with our product experts to discuss potential process changes to prevent any disruption to your business. What actions do customers need to take? We recommend that customers communicate this change to their teams and move any processes that rely on this Chrome Extension to the SalesforceIQ CRM desktop app directly. Your long-term success remains our #1 goal, and we look forward to working with you on this or any other questions you may have, including the SalesforceIQ CRM retirement on March 13, 2020. As we have communicated, we’re enabling all existing customers to move to a comparable edition of Sales Cloud for the same monthly rate per subscription. This offer also includes access to the Inbox application for Sales Cloud. * We'd be happy to discuss how to replicate your day-to-day tasks in the SalesforceIQ CRM Chrome Extension in the Sales Cloud and Inbox content. In your Chrome browser, click in the upper-right corner. From the menu, select More Tools > Extensions. On the Extensions page, click to the right of SalesforceIQ CRM.